49ers Woes: Who’s to Blame? On the last play of the game Sunday, 49ers quarterback Colin Kaepernick took the snap, look around for an open receiver, and ended up taking a sack. That play not only summed up the day after a humiliating loss to the Raiders, but has defined the once-dominate 49ers over the last couple weeks. 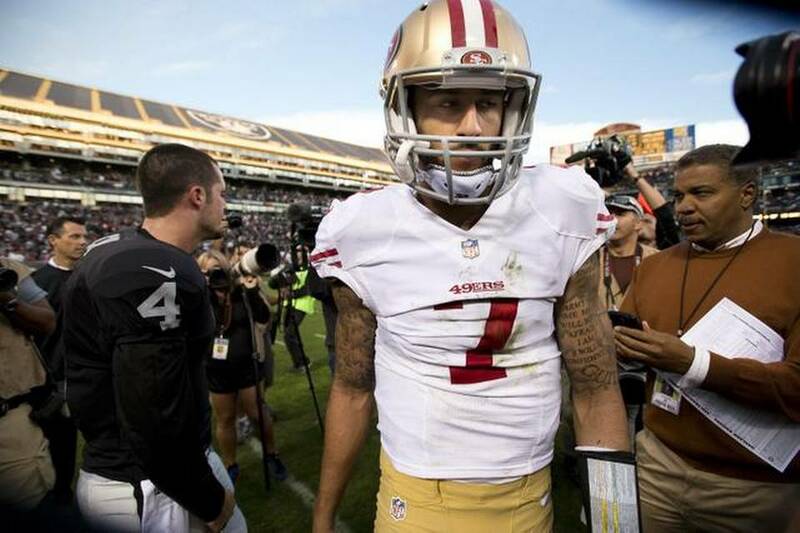 Kaepernick arose from the pile looking dazed, confused, and defeated; probably similar to the feeling of the 49ers front office. The question that has been pondering in San Francisco, is where do we go from here? Well the obvious answer to that, is not to push the panic button just yet. Its premature to make any conclusive decision. As we know in the NFL, everything is week to week, and we have seen teams turn it around. Remember back in Week 4 when one highly regarded NFL analyst said the New England Patriots were “weak” and “NOT good anymore”. I’m sure Mr. Dilfer is eating those words right about now. Remember whenAaron Rodgers had to tell Packer Nation to relax, after a subpar 1-2 start. Currently the Packers and the Patriots are two of the best teams in the league and could be a potential SuperBowl match up. Now am I saying that the Niners are in the same category? Absolutely not. It will be extremely tough and highly unlikely for them to get a playoff berth at this time. But do they deserve the harsh criticism? I understand that they lost to a terrible Raiders team. I understand that there’s a sense of urgency to win in a league where there’s only 16 games total. Every game matters. There’s not a lot of room for error, which is why we see a lot of quarterbacks benched and head coaches fired midway through the season. But you also have to evaluate what “is” working. Since Jim Harbaugh took the helm , he is 43-17 as the head coach. Which is pretty darn good. I am aware with the rumored disputes he was/is having with the front office, but all Jim Harbaugh has done since coming to San Francisco is win, including three consecutive NFC Championship games. He gave life to a recently dormant franchise. Kaepernick has clearly under performed this season, and his current stats are indicative of that. His QBR is a disappointing 52.18, and he is leading the league as a sack victim. While the sacks could be a clear indication of an inconsistent offensive line, Kaepernick stills needs to make wiser decisions in the pocket; especially if he’s determined to become strictly a pocket passer. Frank Gore and the rushing attack hasn’t been as effective either. Most of the 49ers success over the last 4 years has been attributed to a balanced offense, when includes a strong rushing offense. That has been a non factor this year, as the team is currently ranked 16th in the league in rushing. Not terrible, but not the Niners. The defense is clearly not the issue, as the Niners are currently ranked third in total defense throughout the NFL. I point the finger to offensive coordinator Greg Roman. They are equipped with a lot of weapons on offense including Gore, Boldin, Crabtree, Davis, Johnson, and Kaepernick. When everyone is healthy, they have the ability to be a high powered offensive machine. I do not believe Roman is maximizing everyone strengths. I also question some of the play calling in the second half of the loss to the Raiders. Wherever the blame is to go, one thing’s for sure: the Niners must do better. Whenever the C.E.O has to tweet out an apology to the fans, that’s never a good sign.